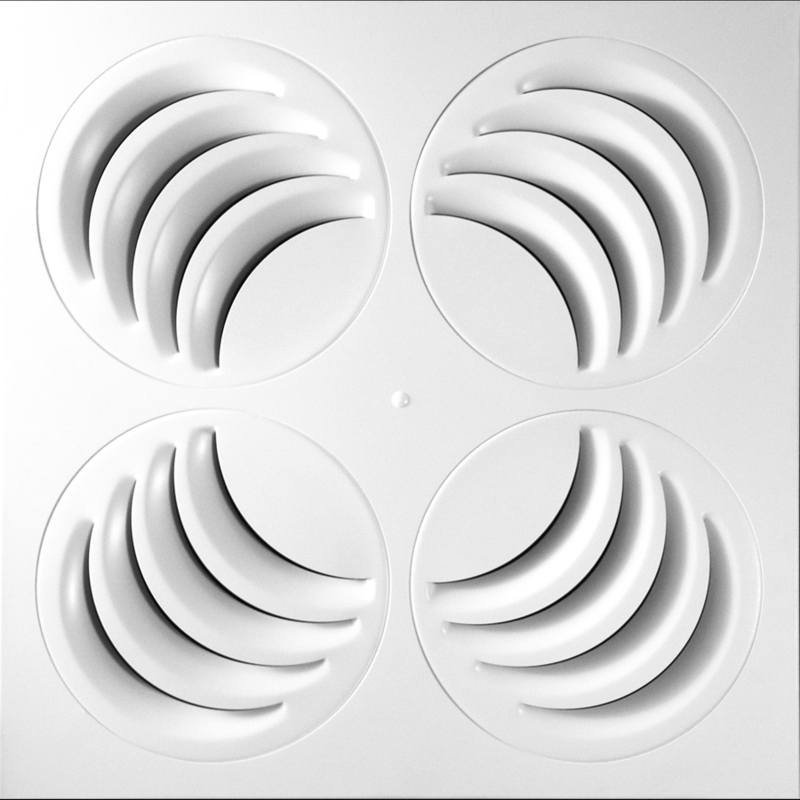 The fully adjustable REV Diffuser solves the most common HVAC-related comfort problem: ventilation and air conditioning drafts! 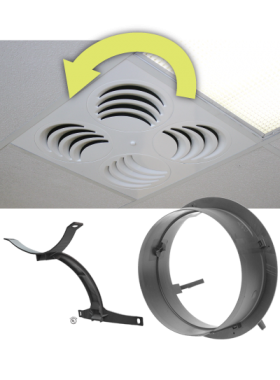 Each round sector can independently rotate 360-degrees to redirect airflow in any direction, letting technicians and air balancers avoid specific people and objects without affecting other people around the same diffuser. 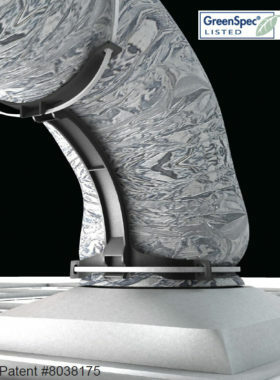 This innovative design represents a breakthrough in air diffusion technology. The unanimous reaction to our REV Diffuser is: FINALLY A SOLUTION THAT REALLY WORKS! 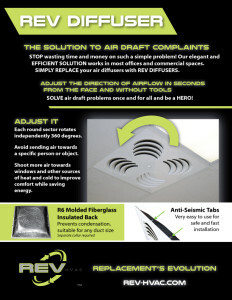 Thanks to the REV Diffuser, it is now possible to solve air draft problems once and for all, without creating new ones in the process. 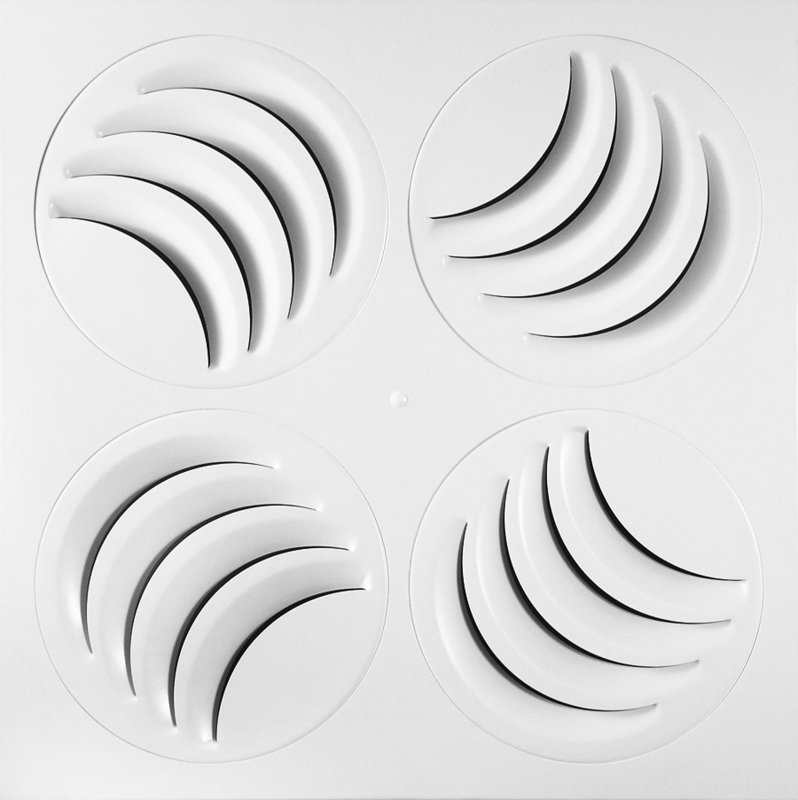 The REV Diffuser is easy to adjust and can replace most diffusers already installed in existing buildings. 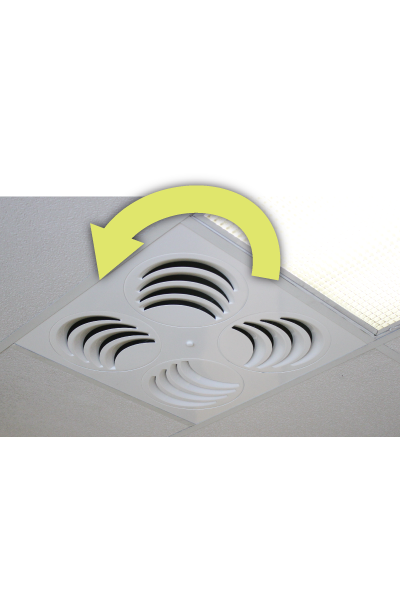 REV is ideal for offices, schools, restaurants, stores and other commercial buildings. 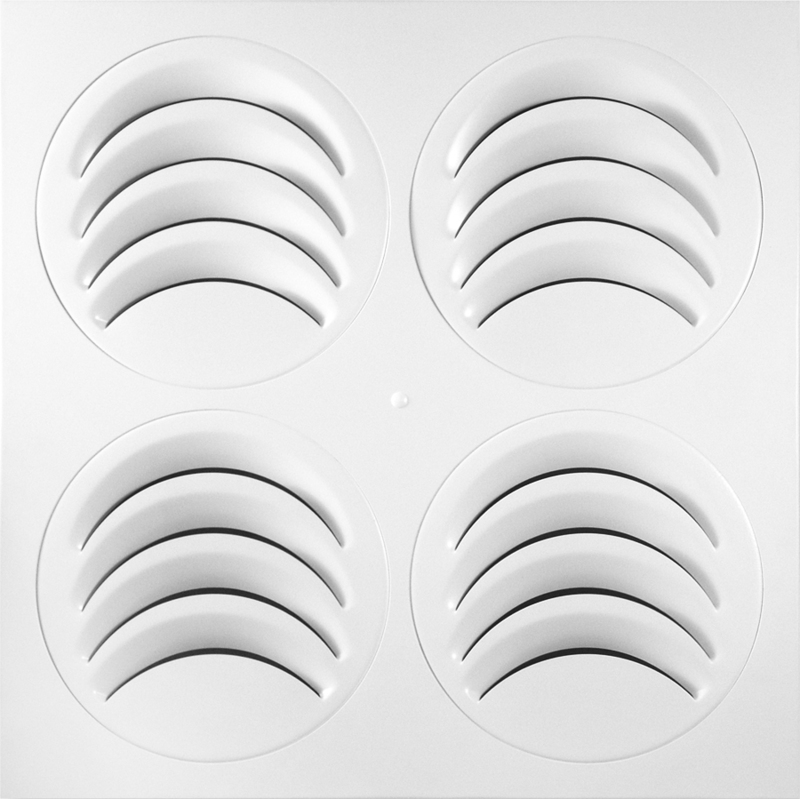 Unanimously acclaimed by Facility Managers, Building Operators, Technicians and Occupants, the REV Diffuser is simply the most efficient solution to common air draft problems. *Free shipping applies to orders shipped to continental USA and Canada only. Special discounts on 20 or more REV Diffusers, contact us for pricing. 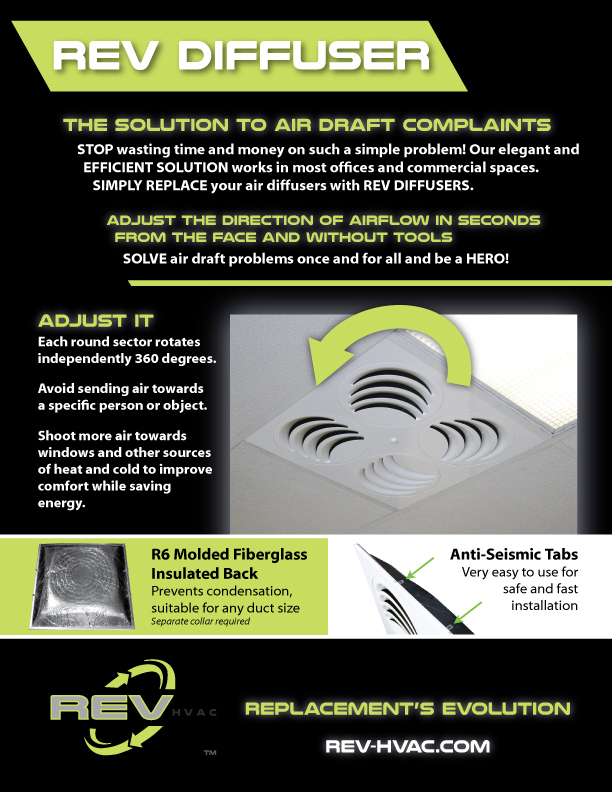 Thanks to the REV Diffuser, it is now possible to solve air draft problems once and for all, without creating new ones in the process. 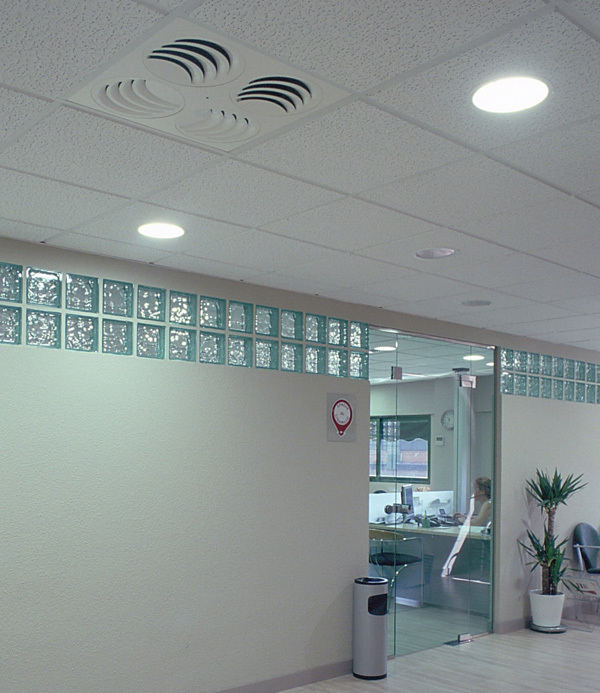 The REV Diffuser is very easy to adjust and can replace most diffusers already installed in existing buildings. 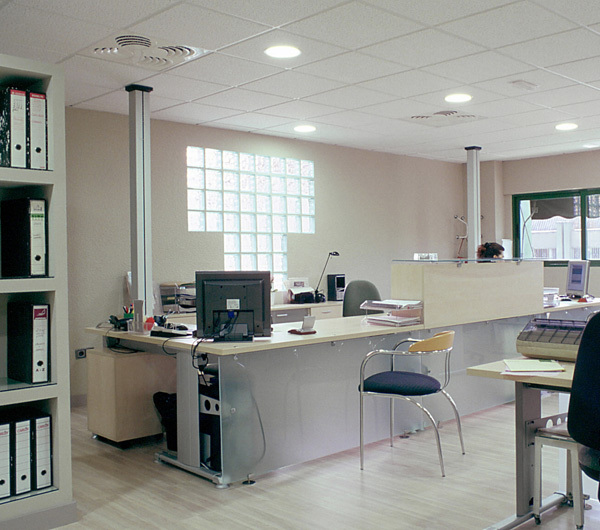 REV is ideal for offices, schools, restaurants, stores and other commercial buildings. 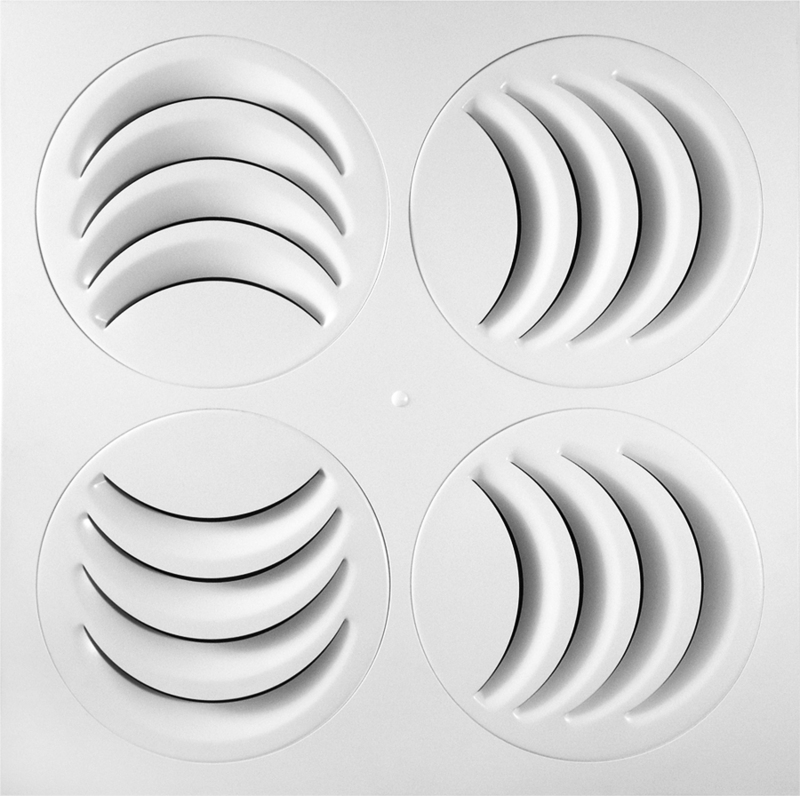 It performs extremely well in heating, ventilation and air conditioning applications between 150 cfm and 400 cfm. 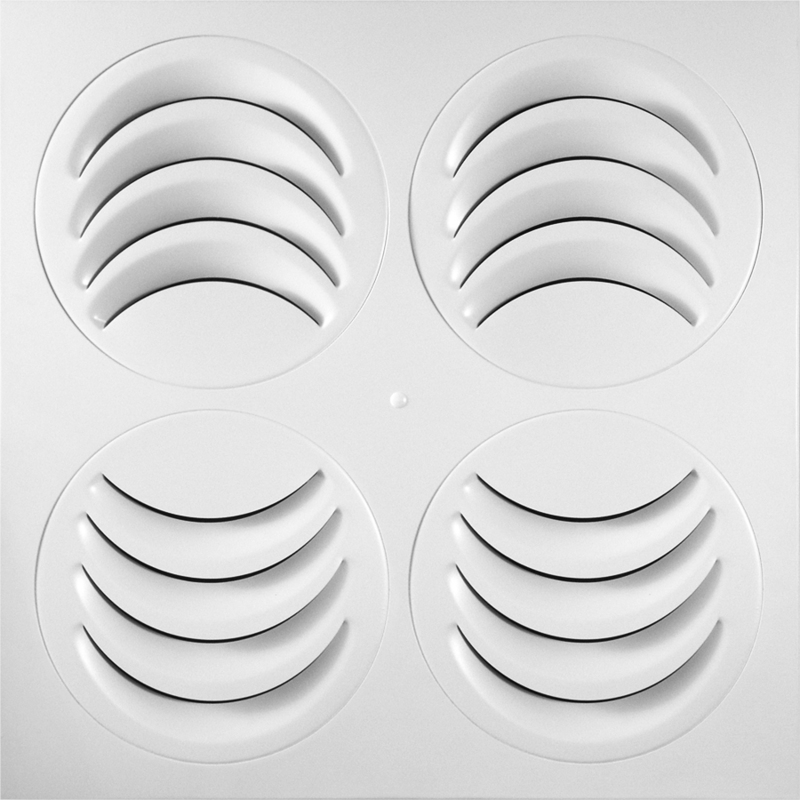 Unanimously acclaimed by building operators, technicians and occupants, the REV Diffuser is simply the most efficient and attractive solution to air draft problems. 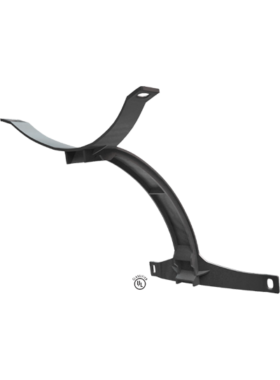 The REV Diffuser is a great short – and long – term investment. 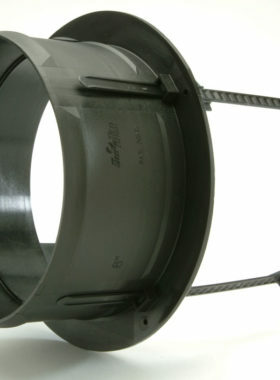 It immediately solves air draft problems and saves time, frustration and money in the long-term. 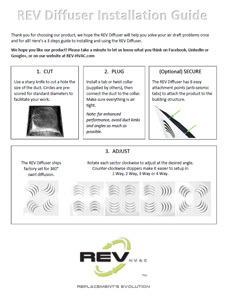 Thanks to the REV Diffuser, air conditioning can finally achieve its real purpose: improving your comfort. 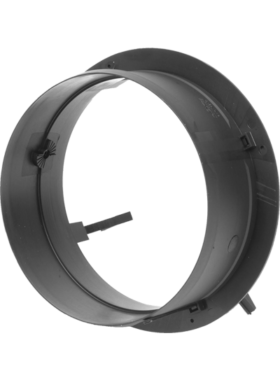 The REV diffuser’s plenum is made of 1″ molded fiberglass providing an R-6.0 thermal insulation value. 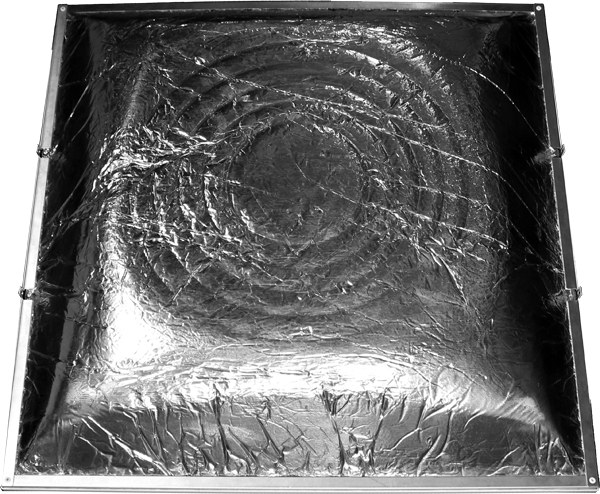 It is covered with tin foil on the outside and a fire rated black mat on the inside. The black mat is there for two reasons: aesthetics and safety. Although molded fiberglass is considered safe because fibers are contained, adding a mat to prevent any direct exposure makes the REV Diffuser even safer – 100% safe in fact. 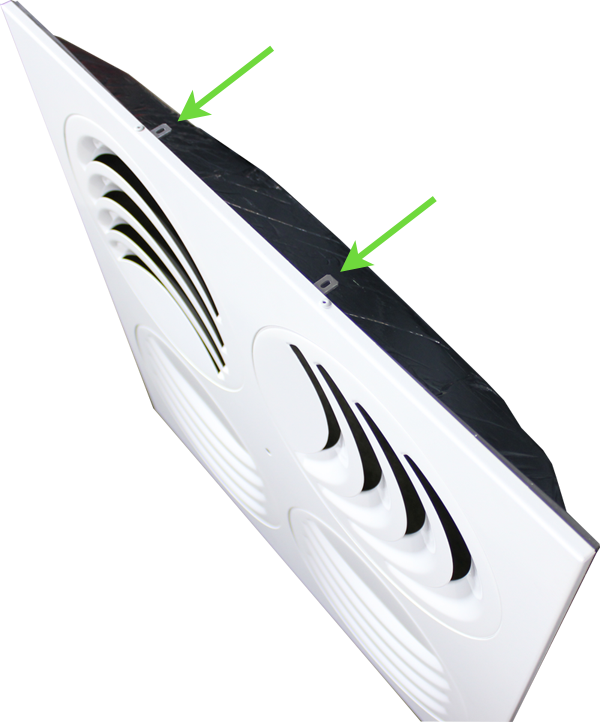 The black mat also hides the greenish molded fiberglass, making the plenum virtually invisible when looking at the diffuser from the room. 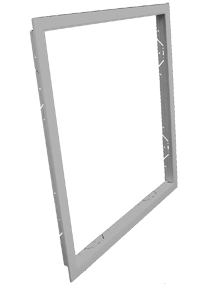 The back of the diffuser has eight easy attachment points – also called anti-seismic tabs – to attach the diffuser to the building structure.